Not many drivers have been able to beat Kevin Harvick in a head-to-head battle this season. Clint Bowyer can now claim credit for doing so. 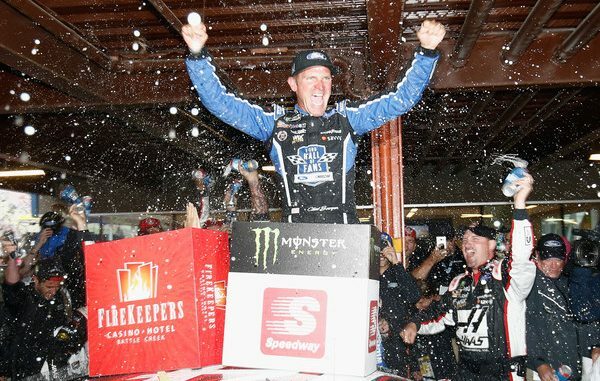 Harvick’s Stewart-Haas Racing teammate beat Harvick in a furious battle with rain threatening coming out with the lead just before the rains came again Sunday and held on to win the Monster Energy NASCAR Cup Series Firekeepers Casino 400 at Michigan International Speedway. After waiting out a two-hour fifteen-minute rain delay polesitter, and SHR drive,r Kurt Busch would lead the first 46 laps, and after a brief stint up front by Ryan Blaney, that included a Stage 1 win, Harvick would take control of the race on lap 72 and would go on to win Stage 2, making the race official. The key to the win for Bowyer came during the pit stops at the end of that stage. Bowyer was able to get out with the lead by taking only two tires with Harvick, who took four, close behind. On the restart on lap 126, Bowyer and Harvick dueled side by side for several laps with Bowyer emerging with the lead on lap 129. Behind, Ricky Stenhouse Jr. running in 21st at the time, spun and the eighth caution of the day came out. During the caution the rains fell again, and after a bit of confusion the field was stopped in pit road. Moments later NASCAR declared the race official. Kurt Busch held on for third with brother Kyle fourth and Paul Menard fifth. It was Bowyer’s first win at Michigan the 10th of his career and his second of 2018. For Kyle Larson the day could not have gone worse. The winner of the last three consecutive Michigan races started 25th but by lap 25 he was 12th and second at the end of Stage 2. A pit stop miscue put him outside the top 10 on the restart then spun on lap 85 with a flat rear tire while running eighth. He would lose a lap then make it back up but in the rain-shortened race ran out of time and was scored 28th. 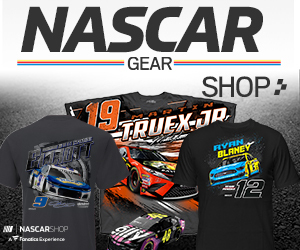 The three Joe Gibbs Racing cars all overcame adversity. All three failed pre-race inspection and were sent to the back of the field. With a combination of hard driving and pit strategy all were able to salvage decent finishes; Kyle Busch with his fourth place, Denny Hamlin 12th after running in the top five for a time, and Erik Jones 15th. The rainy day belonged to Bowyer the SHR team and Ford. Three SHR drivers finished in the top 10 with the fourth, Aric Almirola finishing 11. Seven of the top ten finishers were Fords an important distinction with the race held in the backyard of the major American automakers. Brad Keselowski, Joey Logano, and Ryan Blaney, all Team Penske drivers finished 6-7-8 with Chase Elliott and Jamie McMurray rounding out the top 10. The Monster Energy NASCAR Cup series has a week off before heading to the 1.99-mile road course at Sonoma California of June 24 for the Toyota/Save Mart 350. Live coverage will be on Fox Sports 1 starting at 2:30 p.m. ET.